Slender hoses, blown into arcs by the wind, partially fill the balloon with helium before launch. A large portion of the balloon is left unfilled so it can expand as it ascends into the stratosphere, where air pressure is considerably lower. Scientists have successfully tested a floating solar telescope that hovered high in the Earth's atmosphere while tethered to an air balloon the size of a jumbo jet. The helium balloon and its attached gondola of scientific instruments were launched on Oct. 3 from the Columbia Scientific Balloon Facility in Fort Sumner, New Mexico. The balloon-observatory reached an altitude of nearly 23 miles (37 kilometers) and remained aloft for about 10 hours, capturing stable images and collecting other data of the sun's surface. The gondola separated from the balloon and descended to Earth on a parachute, landing safely in a farm field in Texas. 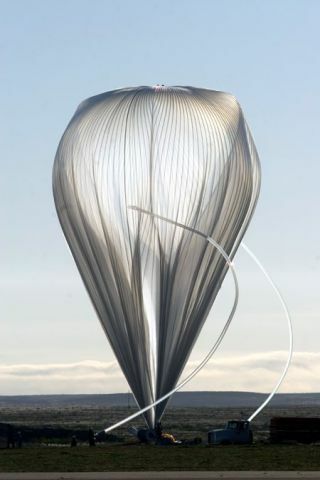 The test clears the way for "Sunrise," a long-duration polar balloon flight planned for mid-2009 that will study the structure and dynamics of magnetic fields on the sun's surface with a 1-meter (39-inch) lens--the largest solar telescope ever deployed into the atmosphere or space. "This unique project will enable us to view features of the sun that we've never seen before," said project team member Michael Knolker, director of National Center for Atmospheric Research's High Altitude Observatory in Boulder, Colo. "We hope to unlock important mysteries about the sun's magnetic field structure, which at times can cause electromagnetic storms in our upper atmosphere and may have an impact on Earth's climate." Sunrise could pave the way for a new generation of balloon-borne telescope missions that cost less than sending instruments into space, the scientists say. "Nowadays, if you were to convince NASA to build a solar telescope with a 1-meter [lens], you would not be able to do that for less than $500 million," Knolker told SPACE.com. "Most likely, it will be a billion-dollar-class enterprise." Scientists associated with the Sunrise project estimate it will cost between $60 million to $80 million. Another advantage of balloon-based observation platforms is that instruments can be recycled and updated for future missions with the latest technologies. "That is a tremendous advantage as compared to a satellite that is deployed once and for all," Knolker said. Alex Pevtsov, a NASA program scientist for solar physics in Washington, D.C., involved in determining Sunrise's funding, called the test flight a "great success." Pevtsov also sees balloon missions as a test bed for technologies to be flown in space. "If you want to develop something new, that would be a way to test how things work," Pevtsov said in a telephone interview. Sunrise is slated for a multi-day flight over the Arctic in summer 2009, where it will take advantage of the midnight sun in the high latitudes to snap images continuously for up to two weeks at a time. The continuous telescope observations will enable scientists to witness in real-time changes in the sun's magnetic field without the interruption of night. The balloon's high altitude will also mean the telescope won't have to contend with image-blurring turbulence or ultraviolet-absorbing water vapor and ozone. The telescope's large lens will give it a resolution more than double that of current space-based instruments and will be capable of imaging features on the sun's surface as small as 19 miles (30 kilometers) across. That sharp resolution will be necessary to resolve the smallest scale structures predicted by theory to drive what Knolker dubs the "solar magnetic machine." "The problem of solar magnetism is hard to tackle because all scales—from the largest to the smallest—matter," Knolker said. "The scale of the whole sun is a relevant scale, and then all the smaller scales up to it are also relevant for a complete description of the physical processes that give rise to activity."